Olsen Gruin – 30 Orchard St.
From October 13 to November 12, Olsen Gruin is displaying “Ornithurae Volume 1,” an exhibition of twenty-one stunning photographic prints by Leila Jeffrey. Her large portraits of small birds dignifies both her subjects’ striking plumages and distinctive personalities. Leila Jeffreys - Scratch Sulphur Crested Cockatoo 2017, fine art inkjet print on cotton rag archival paper, 44 x 35 inches (standard), 55 x 44 inches (large). Image courtesy Olsen Gruin. Leila Jeffreys - Skye Red-tailed Black Cockatoo 2017, fine art inkjet print on cotton rag archival paper, 44 x 35 inches (standard), 55 x 44 inches (large). Image courtesy Olsen Gruin. CANADA – 333 Broome St.
Canada Gallery houses two shows running from October 20 to December 10. “Working/Not Working” showcases seven artists, including Yoko Ono, presenting an intersection of the natural and domestic. “Hocket” is a solo show of multimedia abstract works by Matt Connors emphasising linear forms and negative space. Matt Connors - Yet to be titled, 2017, Oil, acrylic, colored pencil on canvas, 75 x 59 in (190.5 x 149.86 cm). Image courtesy CANADA Gallery. Matt Connors - Lowered Bright Entry Point, 2017, Oil, acrylic, and colored pencil on canvas, 22 1/2 x 19 1/4 in (57.15 x 48.895 cm). Image courtesy CANADA Gallery. Pablo’s Birthday – 57 Orchard St.
At Pablo’s Birthday, a show of Davide Balliano, Lukas Geronimas, and Leah James occupies the ground floor with graphic monochromatic pieces sure to capture your attention. Eight Shawn Kuruneru canvases charm the upstairs gallery walls with their sultry streaks of light and colour. Davide Balliano - Untitled_0061, 2017, Plaster, gesso & lacquer on wood, 48 x 36 inches. Image courtesy Pablo's Birthday. Davide Balliano - Untitled_0074, 2017, Plaster, gesso & lacquer on wood, 80 x 64 inches. Image courtesy Pablo's Birthday. 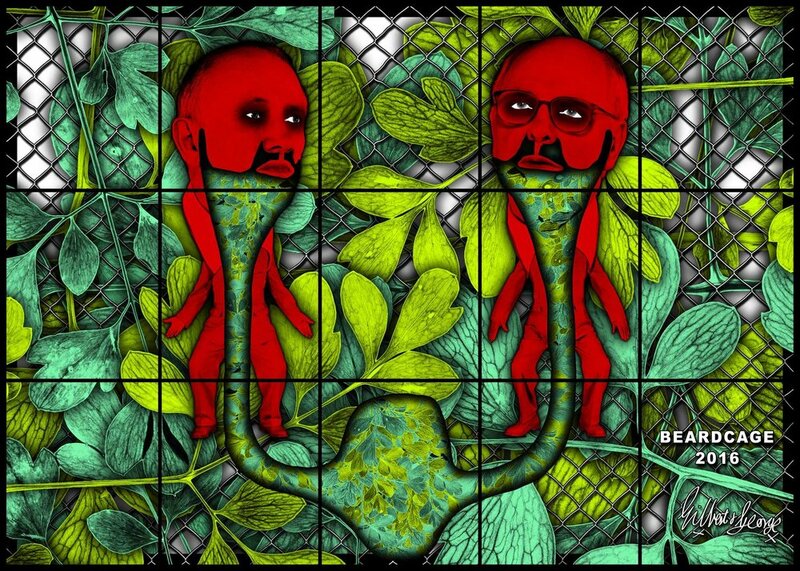 Lehmann Maupin – 201 Chrystie St.
GILBERT & GEORGE - BEARDCAGE, 2017, mixed media, 226 x 317 cm. Image courtesy Lehmann Maupin.